new experiences, new sensations and new colors! 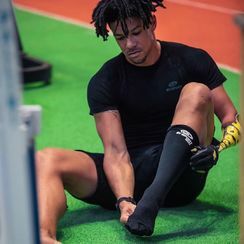 BV SPORT combines 20 years of experience and research in support and compression and aims to improve the physiology of athletes at all levels. Numerous scientific studies* validated by the founding physicians of BV SPORT and by independent clinical research centres* confirm the superiority of the BV SPORT concept, with corroborating evidence from the fields of MRI (ultramodern medical imaging), ultrasound, vein scans and morphological measuring devices. 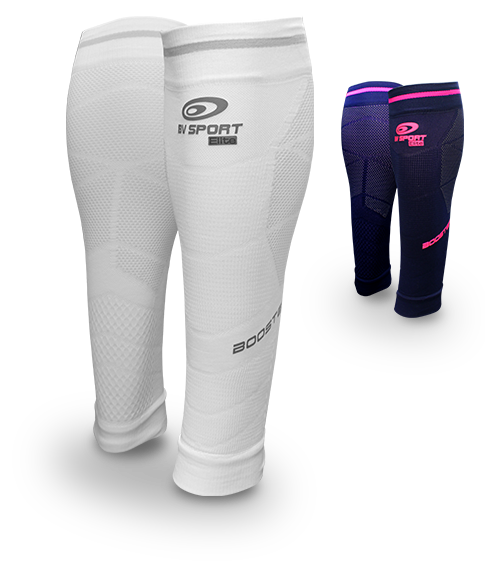 Technology Alternating ultra-flexible and rigid mesh for better cushioning and shock absorbency. 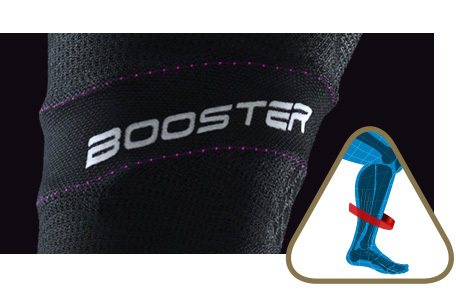 Mechanism of action This new knit technology is used across the whole of the BOOSTER ELITE EVO2 and dissipates the shock waves generated from the impact to the limb during weight-bearing. Benefits Significantly dampens unwanted vibration and oscillation, which cause muscle damage and injury (periostitis, tibial fractures, DOMS). 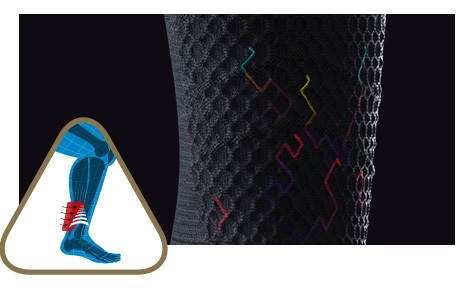 Technology Targeted pressure and rigid mesh for the calf. Mechanism of action Improves venous return and accelerates the elimination of toxins (CO2, free radicals) accumulated in the calf. Dampens muscle vibration and oscillation. Benefits Delays heavy legs and increases the threshold for fatigue. Reduces the onset of periostitis and DOMS. Technology Flexible and Aerated mesh positioned over the tibia. Mechanism of action Protects the sensitive pre-tibial structures (periostium, superficial nerves and microcirculation). Benefits Greater comfort and perception. Reduces the onset of periostitis. 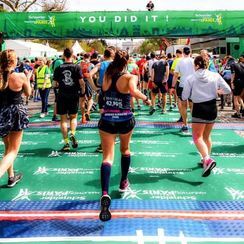 Technology A cellular 3D mesh for greater Achilles tendon support. Mechanism of action The cumulative effect of the 3D Socket and Shock Wave meshes disperses muscle vibration and oscillation thanks to its cellular structure. 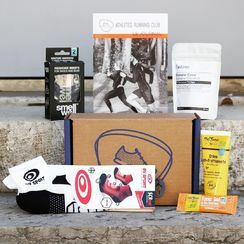 Benefits Reduces the risk of Achilles tendon inflammation. Technology Semi-rigid mesh positioned to support the anterior tibia and triceps surae (lateral/medical gastrocnemius and soleus). 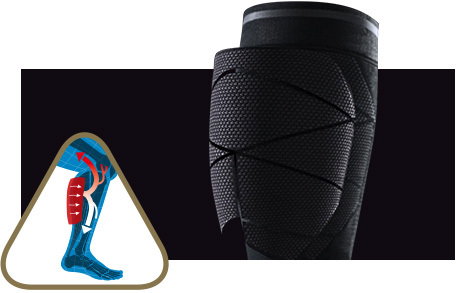 Mechanism of action The Tap Control mesh supports the tendons of the triceps surae and anterior lower leg. 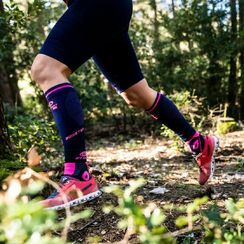 Benefits Reduces the risk of tendinitis and injury and improves muscle efficiency during weight-bearing, especially on uneven surfaces and inclines. 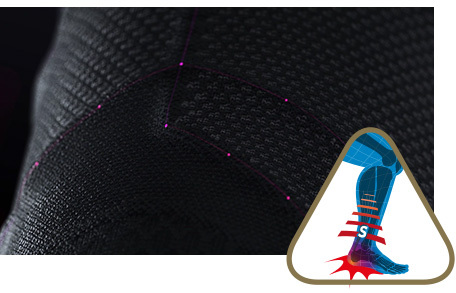 Located in Saint-Etienne, our production facility produces all the compression support ranges. 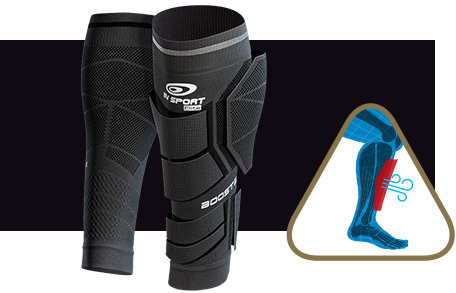 These product ranges meet strict specifications set by our research and development centre, includes sports physicians and textiles engineers. 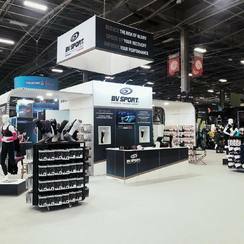 Since its creation, BV SPORT has accompanied top-level athletes in the accomplishment of their feats like the French national football team which was the first to equip its players at the 1998 World Cup. 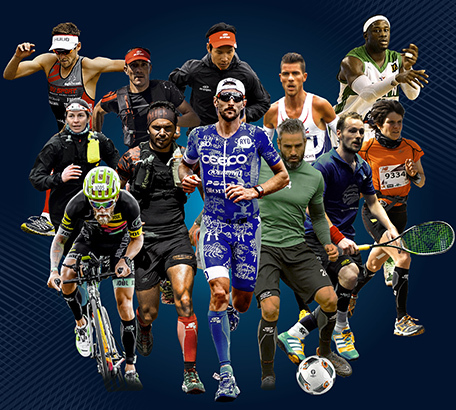 Today, more than 10,000 athletes endorse BV Sport's products, as do the French athletics, volleyball and hiking federations, and the majority of French football clubs in league 1 and league 2 and major European clubs. 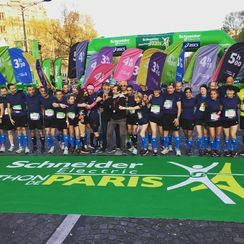 Among them 230 World Champions or Olympic Champions in various disciplines. With our leading French national football team at the top!